alaTest has collected and analyzed 174 reviews of Panasonic HX-WA20. The average rating for this product is 4.1/5, compared to an average rating of 4.0/5 for other Camcorders for all reviews. Reviews about the image quality and price are overall positive. The size and portability are also mentioned favorably, whereas many are negative about the connectivity and memory. We analyzed user and expert ratings, product age and more factors. 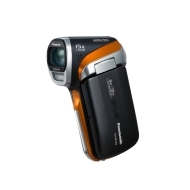 Compared to other Camcorders the Panasonic HX-WA20 is awarded an overall alaScore™ of 86/100 = Very good quality. alaTest has collected and analyzed 20 user reviews of Panasonic HX-WA20 from Amazon.co.uk. The average user rating for this product is 4.3/5, compared to an average user rating of 4.0/5 for other Camcorders on Amazon.co.uk. Reviewers are impressed by the size and image quality. The portability and durability are also appreciated, whereas opinions are divided on the design. The connectivity and battery get negative opinions. alaTest has collected and analyzed 3 user reviews of Panasonic HX-WA20 from Amazon.com. The average user rating for this product is 2.3/5, compared to an average user rating of 3.9/5 for other Camcorders on Amazon.com. Good for carrying about for quick point and shoot shots and video . Weather proof so ideal for wet weather photos . Very poor battery life. Filmed for about 20 mins and also took about 30 photo s then battery died. Purchased 2 extra (more powerful) batteries for the device. Fast start with when the screen door is open so you don't miss a shot. The slow mo is excellent. Still image is good and has a good wide angle. Good flash for a small unit. Good for left handers as well. Controls are a bit difficult if wearing gloves. It's easy to pick the wrong option if your not paying attention. Need to open viewer to film, no lens cover.